“Impudent witch.” “Vile jailbird.” “Mrs. 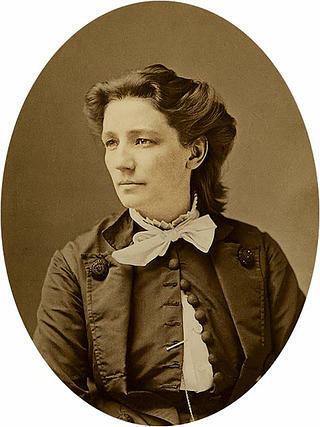 Satan.” There’s no question that Victoria Woodhull, the first woman to run for president, was years ahead of her time, and it frequently made her a target of ridicule among her contemporaries. She made her bid for the highest office in the nation in 1872 as a nominee of the Equal Rights Party, a full 136 years before Hillary Clinton launched her first campaign. Woodhull’s life was a rich tapestry of marriages, scandal, rabble-rousing, and activism. This clock at the Robbins-Hunter Museum is one of only two markers honoring Woodhull in the United States. 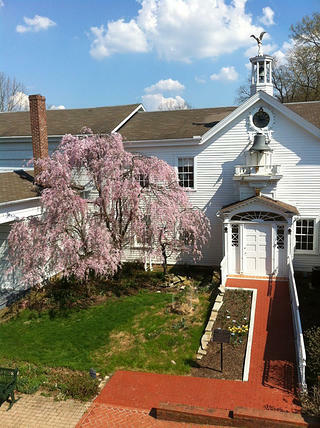 The clock sits above a doorway at the Robbins-Hunter Museum, located in the circa-1842 Avery-Downer house. Born in tiny Homer, Ohio, to indigent parents in 1838, Victoria California Claflin spent much of her childhood at the mercy of her father’s moneymaking schemes. With less than three years of formal education, she worked as a child preacher, fortune teller, clairvoyant and “magnetic healer” before her first marriage, at age 15, to the disreputable Canning Woodhull, an alcoholic, morphine addict, and serial adulterer. She had two children with Woodhull before eventually divorcing him, although she kept his last name for the rest of her life. In 1866, she married spiritualist and Civil War hero Col. James Blood. This also ended in divorce, but the union would end up being serendipitous for Woodhull. In 1868, Blood encouraged Woodhull and her sister Tennessee “Tennie” Claflin, six years her junior, to move to New York, where Blood lived part-time. The sisters secured a house on the city’s Great Jones Street and convinced shipping and railroad magnate Cornelius Vanderbilt to hire them as his personal spiritualists. He eventually agreed to fund a brokerage firm helmed by the sisters. (It’s been rumored, but not confirmed, that Claflin was also his lover.) In 1870, the firm of Woodhull, Claflin & Co. opened on Manhattan’s Broad Street. 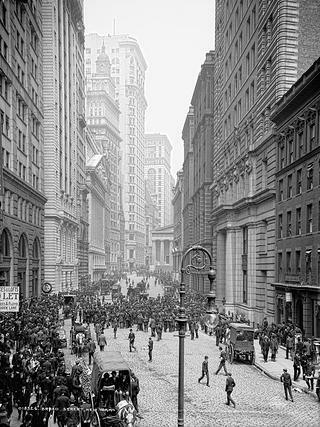 A nineteenth-century photo of Manhattan's Broad Street, where the Claflin sisters set up their own brokerage firm with the support of Cornelius Vanderbilt. The profits allowed the sisters to found their own newspaper, Woodhull & Claflin’s Weekly. Within the pages of their publication, they advocated for eight-hour workdays, gender and racial equality, and sexual education for teenagers. Many of the views espoused in the paper are still considered progressive today, more than a century after the fact. In January of 1871, Woodhull became the first woman to appear in front of the Judiciary Committee of the U.S. House of Representatives at the United States Capitol, advocating for women’s suffrage and arguing that, in fact, nowhere did the text of the Constitution deny women the right to vote. Woodhull was a gifted orator, and her appearance caught the attention of Elizabeth Cady Stanton and Susan B. Anthony, catapulting Woodhull onto the national stage. But as they say, all press is good press, and the publicity only fueled the flames of Woodhull’s candidacy. It seems unlikely that she ever thought she would win, but the candidacy gave her a national platform to talk about women’s suffrage and other progressive issues. She named Frederick Douglass as her running mate, but there’s no proof that Douglass ever accepted or even acknowledged the nomination. “Even if my bid for the presidency is not successful, it will, in fact, be an education for women,” Woodhull said of her campaign at the time. Anthony Comstock, of the New York Society for the Suppression of Vice, made it his personal mission to suppress the ideas of the Claflin sisters, and he had them arrested eight times within a six-month period. At the end of this ordeal, they were bereft of friends and allies and nearly broke. When Cornelius Vanderbilt died in 1877, his heirs may have paid the sisters to move to England so they wouldn’t be present to contest his will. In any event, both sisters married rich members of the landed gentry on the other side of the pond, where they spent the last thirds of their respective lives. Woodhull died in 1927. Today, Woodhull has been all but erased from the history books, and only two monuments to her exist in the United States, both in her home state of Ohio. 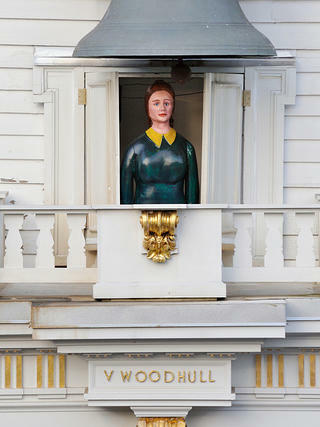 A distant nephew, Scott Claflin, fought to have a historical marker placed outside the public library in her birthplace of Homer, and on the outside of the Robbins-Hunter Museum in nearby Granville, a hand-carved wooden statue of Woodhull comes out of a clock tower to greet visitors every hour. “She was one of the most interesting women, and one of the most humanitarian-driven people, in United States history,” says Judith Dann, a historian and professor at Columbus State Community College in Columbus, Ohio. Dann was involved in creating an exhibit on Woodhull at the Robbins-Hunter Museum, which will run through December 30, 2016. The exhibit includes period campaign music, 37-star flags, period drawings and newspaper articles, and some of Woodhull’s collected writings.